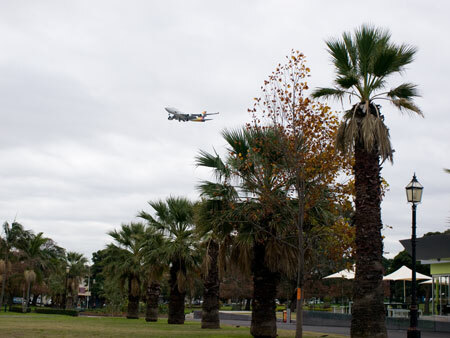 You are currently browsing the tag archive for the ‘park trees’ tag. couple of weeks ago. Once we got down to have a look it became apparent that all the Poplars are dying. 6 Poplars are stone dead. I was told they died last year. They stand like mutilated sentinels, a ghostly grey. This is an avenue of 21 Poplars planted around 40-years ago. 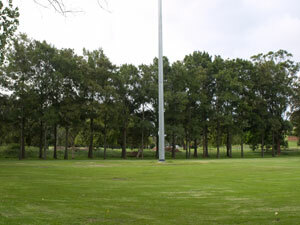 As a guess, each tree would be about 22-26 metres tall. 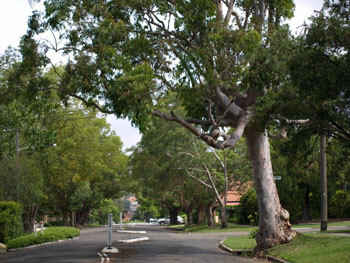 These are substantial trees in Marrickville LGA as there are not many of this height & size. They are also landmarks as they are visible from many areas on both sides of the river. From my reading I understand that all trees should be checked periodically for signs of disease. Borer infestations can be diagnosed before dieback starts by seeing holes on the trunk or branches. 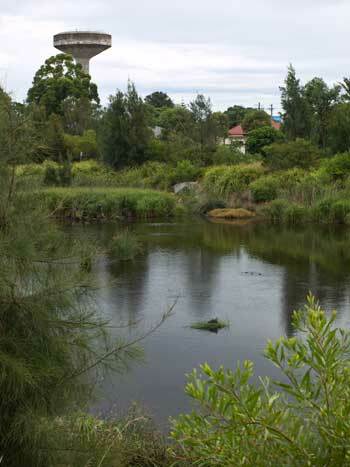 At this state, systemic, chemicals can be put into the ground around the tree (maybe a problem with the Cooks River metres away, though they say the chemicals are non-toxic). Chemicals are also injected into the tree to kill off all boring insects at whatever stage of development they are at. There is also a technique of literally skewering the insect to death. Then the tree is fertilized to help fend off the stress it has been under. 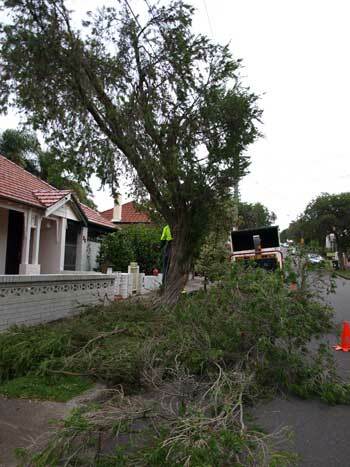 If the tree is severely infected, it needs to be destroyed on site to prevent taking the insects to another location. 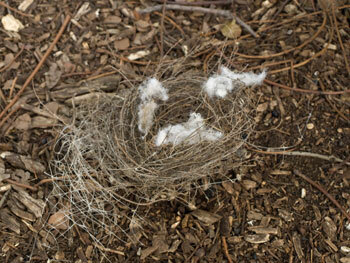 The trunk & roots need to be removed from the soil as well & the soil treated before any new trees can be planted. One by one we looked at the trees along the Wharf Road side of Mahoney Reserve. It was difficult to find a tree that wasn’t showing borer holes & rot. Many had ant infestations as well. The trees of Mahoney Reserve are very sick. Dieback takes a while to manifest, sometimes up to 5 years. My limited knowledge tells me that planting new trees will just provide further resources for the boring insects that are in control of this area unless the infestation is removed. The Poplars especially, with their 2-3 metre girth are substantial carbon sequesters. To have lost 6 & have the rest at serious risk of being chopped down as well is devastating on a number of levels. Big canopy trees is what the park needs to replace the trees that have died & any others that will be lost. We saw boring damage on about 70 trees in the one park & there are probably more. Just leaving the problem play itself out is not a solution. This park needs a comprehensive management plan to ensure what trees can be saved are saved & a replacement program be implemented to plant trees that will produce substantive trunks & shade. 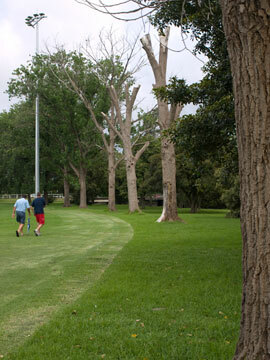 Shaded avenues along the parks & the river walks will be more & more essential as the sun is getting hotter & hotter. 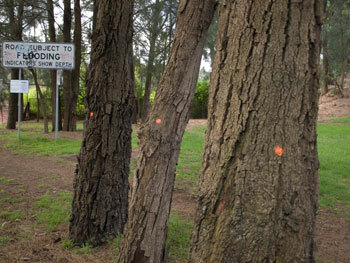 It was hard to find which trees were due to be removed though 3 quite old & haggard Casuarinas have a pink dot spot spray painted on their trunk. I’m taking a guess that these are 3 of the trees. As for the other 3 Casuarinas it is anyone’s guess & I could not find the Coastal Myall. 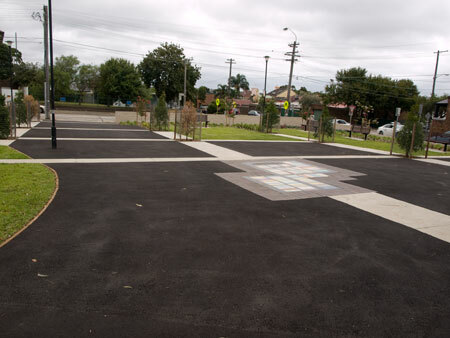 Council say they will replace the trees with “locally endemic Cook’s River Valley tree species,” but don’t say when they will do this. Locally endemic Cook’s River Valley tree species probably means more Casuarinas, which in my opinion is a pity. A few Casuarinas is okay, but these are definitely the predominant species of tree planted along the banks on Marrickville Council’s side of the Cooks River. The Casuarina glauca is considered a weed in Florida because this tree sends up suckers & before you know it, there are more of them. They grow to about 15 metres, are salt tolerant, nitrogen fixing, like swampy or sandy conditions & because of their lateral roots, are good at stabilizing the ground & preventing erosion. They produce hundreds of small cones & tons of branchlets leaf litter that effectively prevent anything other than other Casuarinas growing underneath the tree. Glossy Black-Cockatoo & Gang Gang Cockatoos eat the cones while they are soft, but leave the hard ones. If you ever see either of these birds in this area I would love to know about it. I doubt that they provide food for birds in this area. 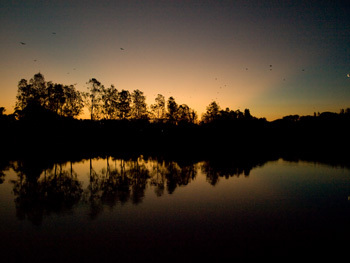 I have seen a family of Cormorants sitting on 2 Casuarina branches that unusually hung over the Cooks River. Casuarinas are described as ‘love them or loathe them’ trees & are recommended for the lazy gardener. This had me shaking my head because I can say that having lived with 5 of these trees for a period of 4 years, all I experienced was tons of hard work cleaning up the profuse litter from the courtyard every week. Leave the job for a month & it became a couple of hours work necessitating a trip to the tip. I guess they fit the bill if the lazy gardener included planting the trees in parks & leaving them alone. I freely admit to being of the ‘loathe them’ camp. 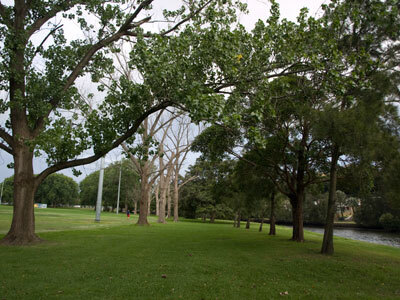 Personally I wish Council would plant a few more varieties of tall Australian native trees like that which has been happening on the other side of the river. 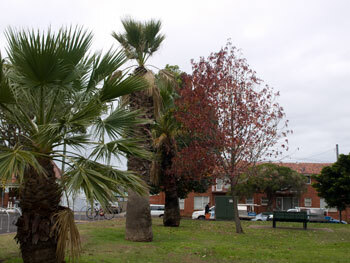 Canterbury Council has planted well over 100 Red Flowering Gums as well as many other species of Eucalypts. There are no powerlines or other restrictions so why not go the whole hog & plant a few Sydney Blue Gums, other Eucalypts (Corymbia) & some Angophoras? These trees are beautiful, provide food & habitat for birds as well as provide plenty of shade where one can sit under. A Casuarina is not a tree I want to sit under, nor have I seen others do this. There is too much chance of being bitten by some insect or spider hiding amidst the debris Casuarinas drop. 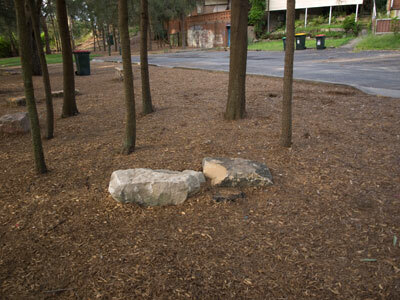 While it does not seem Council is seeking submissions, they do say if we want further information or if we wish to make comment regarding these works we can contact Council’s Tree Management Officer on 9335-2242 or send an email to council@marrickville.nsw.gov.au by Monday 24th January 2011. The Major Projects Steering Committee Meeting meets tonight 5th May 2010. Regarding the Annette Kellerman Aquatic Centre (the new 50 metre pool in Enmore Park) the following is an extract from the committee’s paper. I have been told 31 of the trees have already been removed. We have been following your site for a few months. You are always banging on about birds & Bandicoots. What about us? 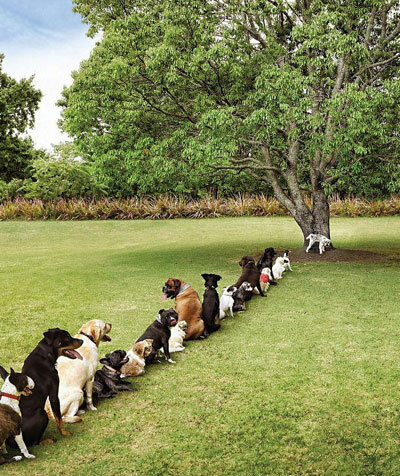 We need trees too! 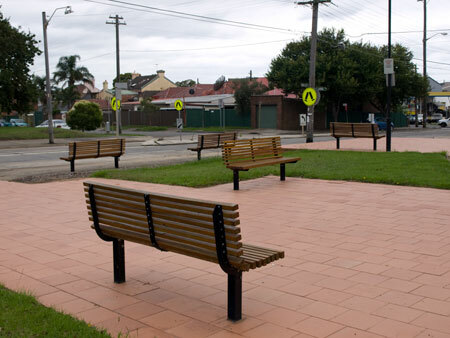 More trees for Marrickville LGA! Dogs have needs as well. 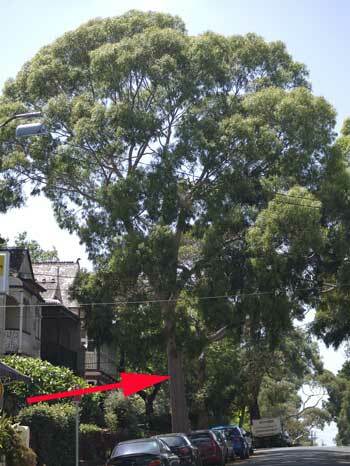 More trees for Marrickville LGA!